A queen ant of the host species Mycocepurus goeldii. 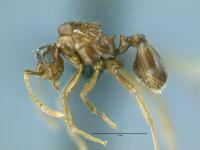 A queen ant of the parasitic species Mycocepurus castrator. M. castrator is not simply another ant in the colony; it’s a parasite that lives with—and off of—its host, Mycocepurus goeldii. The host is a fungus-growing ant that cultivates fungus for its nutritional value, both for itself and, indirectly, for its parasite, which does not participate in the work of growing the fungus garden. That led the researchers to study the genetic relationships of all fungus-growing ants in South America, including all five known and six newly discovered species of the genus Mycocepurus, to determine whether the parasite did evolve from its presumed host. 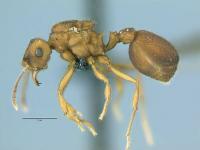 They found that the parasitic ants were, indeed, genetically very close to M. goeldii, but not to the other ant species.